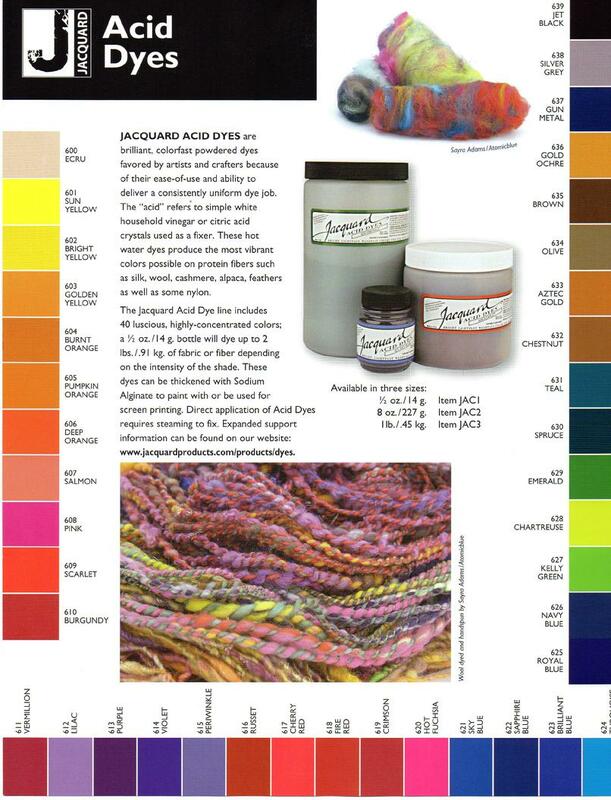 JACQUARD ACID DYES - brilliant, colorfast powdered dyes easy to use. The acid refers to simple white household vinegar or citric acid used as mordant/fixer. These dyes produce the most vibrant colors possible. The Sheep Shed takes Visa, Master Card and American Express for your convience. Currently we take credit card orders over the phone only. Items can be ordered via e-mail, phone, or regular mail. We ship anywhere. Actual shipping costs will be added to the bill. Inventory changes so please let us know if you are looking for anything specific. SHEEPSHED - @ Mountain View Farm Look to us for all your spinning and dyeing requirements specializing in the most fantastic spinning fibers!